Dehydration is the excess loss of water from the body creating an imbalance with the usual levels of salts and sugars, and this interferes with the normal body functions. The loss of a lot of minerals and vitamins make the body weak and tired. Prime Source-OR is a nutritional supplement which helps restore the loss and reenergizes the body. 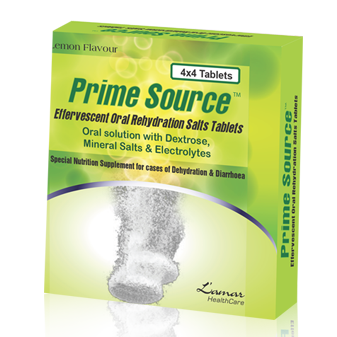 Prime Source-OR, an oral effervescent salt restores the lost minerals and salts by rehydrating the body providing it the right amount of salts and sugars. Take the tablet orally. Place it in a glass of water, allow it to dissolve till the effervescence appears and drink all the liquid. Do not chew the tablet.